If your tooth hurts, it does not have to mean that you have a cavity. Although you may not want to think about it while you are in this sort pain, you can tell by the type of the pain what is causing it. Pains that come from cold and hot drinks and food may indicate cavities, but also the thinning of your tooth enamel. It may also mean that you just have sensitive teeth. Every toothache should end with you going to the dentist, but if that is impossible for any reason, here are the five way you can try to soothe your pain at home. Ibuprofen and paracetamol are the first choices when it comes to taking the over the counter pain medications for your toothache. You should take the pills, approximately on every six hours and you should not rub it in on the gum tissue. However, if you are taking some other types of medication you should inform the pharmacist about it because you definitely want to avoid any contraindications to ibuprofen use that may occur. There are also the ointments and gels that are applied directly to the cavity and/or the gum tissue. These are a bit more dangerous than the pills that you take orally. You need to be careful about the dosages and the way of application. Read the instructions carefully and consult the pharmacist if you cannot reach your dentist. If you are looking for a solution that is more natural, then you should look no further than the clove. They work as natural anesthetics. You use a clove and chew it. That will release the essential oil that should numb the nerves. Also, you can use two drops of essential clove oil on a cotton ball and put it on the tooth itself. The oil applied directly to the skin will burn it and make the pain worse, so pay attention to that. Use one teaspoon of salt in a cup of water. This solution should be gargled in your mouth for thirty seconds before spitting it out. This solution will reduce the swelling, get you rid of debris that may be stuck and wash a thorough layer of bacteria. All these things may cause you pain, so washing it off is very helpful. This solution may soothe a sore throat, as well, due to its antibacterial effect. However, it is only a short term solution and you need to call the dentist if you are nearby or the closest office and make an appointment. Some people prefer icing the tooth, while others feel that the warm press does more good than ice. Icing means that you should put an ice cube in a little bit of plastic, wrap that in a cotton cloth and apply it to the cheek under which is the painful tooth. Some even say that if you apply this ice on the area between your thumb and forefinger, it will send signals for cold to your nerves and distract the pain. Warming up can be done with a little bit of brown paper that is soaked in vinegar and some pepper. Apply it on the cheek and the warm feeling should distract you from the pain. There is always a chance that you are experiencing pain because some piece of food got stuck somewhere and it is applying pressure on a nerve. However, that little piece of food may cause inflammation and a lot of pain. 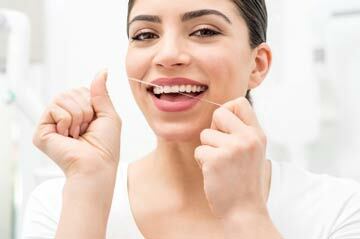 Therefore, you may want to try and brush, wash and floss your oral cavity thoroughly, one more time. It may just solve the problem.